Living in the Belgian Congo with her husband in the 1960s, Fran’s mother became pregnant with a daughter. However, right after she gave birth in the hospital, she felt strange. Unbeknownst to anyone, another daughter was on the way, but before anybody responded, an hour had passed. Because of the delay, Fran was born with cerebral palsy. Growing up with her siblings in Africa, Fran always felt different. When everyone else was playing and having fun, she would watch and wish she could join in. After the family moved to Scotland and Fran grew older, her hurt turned into anger, self-hatred, and suicidal depression. Then one day, someone looked at her and saw a woman to love, and that was the start of her journey to self-acceptance. Fran has written the painful truth about her life to help readers understand how disabled adults really feel. In her revealing account, she shows just how hard it is to maintain the appearance of a normal” life. More importantly, out of her million and one mistakes have come lessons in real acceptance, peace, and joy, which she would like to share with her readers. Fran Macilvey was born premature and disabled in the Belgian Congo in 1965. Returning to Scotland in 1972, she spent eight years at boarding school, then qualified and practiced as a solicitor for ten years before returning to her first passion, writing. 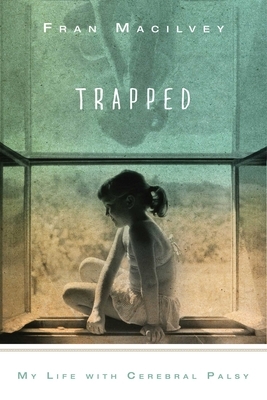 Apart from Trapped she has written two further books drawing on her experiences with disability. When she’s not catching up on her sleep, she reads, writes, sings in the shower, and dances where no one can see her. She lives with her husband and daughter in Scotland.